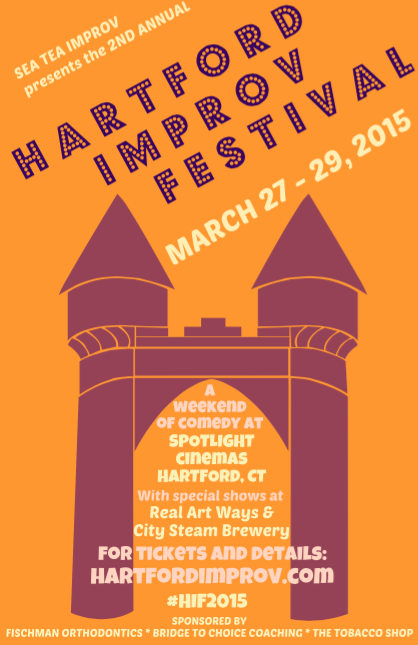 The Hartford Improv Festival – This Weekend! On March 27th – 29th at Spotlight Cinemas in downtown Hartford, Sea Tea Improv will bring back the Hartford Improv Festival for a second year. Last year’s festival drew crowds of hundreds throughout three days of improvisational comedy activities, as well as dozens of improvisers from around the country. Tickets can be purchased at www.hartfordimprov.com. Sea Tea Improv is delighted to announce that performers will hail from all over the country. Teams from Manhattan, Brooklyn, Chicago, Massachusetts, North Carolina, Rhode Island, Vermont, and California will be performing, along with twelve of Connecticut’s best improv teams. Selection this year was very competitive with nearly ninety troupes competing for forty-four performance slots. The performers this year represent the best the country and the state have to offer. Connecticut is well-represented with not only Sea Tea Improv, but Parachute of Conard High School, Purple Crayon of Yale, Horse Lincoln of UConn, The Great Make Believe Society of Middletown, Tick Tick Boom of Manchester, and Ad Hoc and Hot Garbage of Hartford. Connecticut’s growing improv community will demonstrate its talent throughout the weekend. The Hartford Improv Festival (HIF) is Connecticut’s largest improv event of the year as Sea Tea Improv continues to establish Hartford as a hub for comedy at the national level. The Hartford Improv Festival is designed to attract local and national talent to Hartford and showcase the art of improv comedy. Now in its second year, the Hartford Improv Festival (HIF) is continuing to establish Hartford as a hub for comedy at the national level. Each day of the festival will consist of improv comedy performances featuring both local and national comedy talent as well as workshops and master classes. The events this year include four workshops by improvisers from around the country (New York, Boston, Providence and Chicago), held at Sea Tea studios; dozens of improv shows; a Friday-night drop-in jam, a Saturday-night private party at Vaughan’s Public House, and a Sunday night wrap-up consisting of an improvised movie dubbing at Real Art Ways and a performance at City Steam Brewery. Tickets can be purchased for single shows, whole days, or the entire festival. For a full schedule please visit www.hartfordimprov.com. Most of the performances will take place at Spotlight Cinemas in downtown Hartford, where audience members can enjoy the full complement of food and drinks from the theater’s restaurant while watching comedy from across America. One entire movie theater will be given over to HIF comedy shows for the duration of the weekend. Sea Tea Improv is dedicated to showcasing local businesses and talent to the teams and patrons attending the festival. Through post-festival surveys sent to performers and audience members, Sea Tea Improv can report that 70% of last year’s audience respondents and 90% of performers patronized one or more downtown restaurants while attending the festival, and many performers stayed overnight in hotels in the city. HIF2015 is made possible through the generous support of Dr. Steven A. Fischman, D.D.S., Shall Be LLC, Bridge to Choice Coaching, and The Tobacco Shop in Downtown Hartford. Sea Tea Improv is still accepting sponsors for the 2015 festival. For more information on sponsorship opportunities, please email comedy@seateaimprov.com. Sea Tea Improv is an award-winning comedy company based in Hartford, Connecticut and serves students of all ages and experiences.Sea Tea Improv has performed hundreds of shows throughout Hartford, New England, and beyond for the past five years. Their mission is to bring the highest-quality comedy and improvisation to Connecticut, build upon the cultural offerings of Hartford, and lead a dedicated community of improvisers.